If you are planning to use service of 5* Qatar Airways (Oneworld) you migh appreciate their current promotion graintg free access to Wi-Fi during entire flight from selected cities. In Europe you can benefit from this Qatar Airways promotion when departing from the United Kingdom (London). (Also available from USA (Washington, New York, Chicago). Australia (Sydney, Canberra) or Thailand (Bangkok). All you have to do is to make your next purchase through below link directly at website of this carrier. You will then receive special Qatar Airways discount code for unlimited Super Wi-Fi on board your flight. ou can download your access code from the booking confirmation page after you complete your booking at qatarairways.com. You can take advantege of this Qatar Airways promo offer when making your purchase by 14th of November 2018. You can get unlimited Wi-Fi in the sky when traveling from 15th of October 2018 until 28th of February 2019. Qatar Airways discount code code is valid for a limited duration from the date it is issued. The specific expiry date will be displayed on the booking confirmation page. The Super Wi-Fi access code can only be used on one device at a time. Travelers in the UK. Germany, Australia or New Zealand may also benefit from currently valid Qatar Airways promo code grainting 10% discount off all flights departing from the United Kingdom. Travel Period: 15 October 2018 untill 28 February 2019. The Super Wi-Fi access code is valid for a limited duration from the date it is issued. The specific expiry date will be displayed on the booking confirmation page. The Super Wi-Fi access code can only be used on one device at a time. Service interruption may occur when flying over some geographic areas. Offer is only available on select Qatar Airways flights. Please refer to the table above for more information. The Super Wi-Fi access code is valid on Qatar Airways operated and marketed flights only. 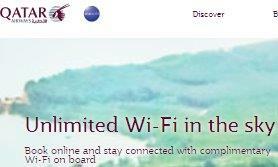 Super Wi-Fi can only be used on one Qatar Airways flight within the booked itinerary. If more than one flight within the itinerary is enabled for Super Wi-Fi, customers can select the flight they would like to use the code on, within the voucher’s validity date. In case of any connectivity issues on board where customers cannot access Wi-Fi, a new code or a re-activation of the existing code will be provided for use on the next flight, if equipped with Wi-Fi facilities, upon approval of Qatar Airways. In case the aircraft is changed due to operational requirements, you can still use the voucher on other Qatar Airways flights that are enabled with Super Wi-Fi within the access code’s validity period. While every effort will be made to confirm that the above mentioned flights are equipped with Super Wi-Fi facilities, this may not always be possible for reasons that include, but are not limited to, aircraft change on the specific routes. Qatar Airways does not assume responsibility in providing Super Wi-Fi on the chosen flight. Service provider terms and conditions apply. Please review at the time of connection. The Super Wi-Fi access code has no cash value and is non-transferrable, non-changeable, non-refundable. If the Super Wi-Fi access code is not used within its specified expiry date, the access code is deemed invalid and considered forfeited. Other terms and conditions apply for flight bookings. Please review at the time of booking.